The Avon Ring travels through the heart of England on canals and rivers, and includes some of the prettiest countryside and most famous sights in England. 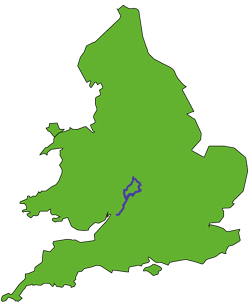 The route takes the River Avon from Stratford-upon-Avon between the Malvern Hills and the Cotswolds through typical English villages. An experienced crew can cover this Ring within a week but it is advisable to spend longer if you want to visit the attractions en route. For most people 2 weeks gives a good blend of sightseeing and cruising. Please note that a licence (approx £50) is purchased on entering the River Avon. Follow the Stourport Ring route up the Worcester and Birmingham canal to Kings Norton junction outside Birmingham. Join the North Stratford Canal through splendid countryside and past delightful villages with quaint names. If time allows you can have a detour along a lock free stretch of the Grand Union to the top of Hatton Locks and then take a train the short distance to Warwick and visit its superb medieval castle. Continuing the Avon Ring, on the South Stratford Canal the canal character changes with split bridges and 'barrel-roofed' cottages. Before reaching Stratford visit Mary Arden's Cottage, Shakespeare's mother's home, close to the canal at Wilmcote. Cross the Edstone Aqueduct in a 754 feet long cast iron trough before reaching Stratford-upon-Avon. At Stratford moor opposite the Shakespeare Theatre in Bancroft Basin and enjoy Shakespeare's birthplace and its many attractions. Details are available from the Tourist Information Office adjacent to the canal basin. In Stratford join the River Avon, which meanders to Tewkesbury, through Evesham and Pershore (reputed to be Borchester in the long running Archers serial on BBC radio). In Tewkesbury visit the magnificent abbey and join the River Severn at Tewkesbury lock. It is a short trip along the wider and picturesque River Severn from Tewkesbury to Worcester and the Worcester and Birmingham Canal to complete the Ring. Out-and-back trips and short breaks are available from all bases. A licence (about £50) is required to enter the River Avon. Out-and-back holidays can be taken from any of the bases along the Avon Ring. For a week's cruise, try out-and-back cruises from Bases 35 and 42 to Stratford upon Avon, or consider the adjacent Stourport Ring. Mid-week and weekend breaks are available from all Canal Holidays bases on the Avon Ring. A short break from Base 39 includes Stratford upon Avon. In a two week trip the Avon Ring can be extended to Gloucester and its restored docks area with the National Waterways Museum. "Thank you for helping with the arrangements for our canal trip. It was just about the best vacation ever. There were seven of us on the narrow boat and we all had a great time. The boat was great and seeing the countryside by canal is one of the best ways. Always a good pub for dinner and pleasant villages to spend the evenings. I would recommend this kind of holiday to anyone who wants to relax." "We found some marvelous places to stop over night, among these were Lowsonford, Stratford, Evesham, Eckington, Draw Bridge, Stoke Prior and near Tardebigge Top Lock. All places had charming inns/pubs with very good food." "The 131 locks were a good work out, but a little ambitious for 2 people!! Boat amenities first class. Loved everything on the River Avon. Recommend the Angel Inn & Posting House, 9 High St, Pershore, Worcs. Quality restaurant. We even enjoyed the rain!!" "Excellent boat, facilities, instructions etc. Even the weather was wonderful. We went up a couple of miles then turned round and made it to the outskirts of Stratford. The route was very pretty and well worth doing for a short trip such as ours." "We went from Tardebigge to Stratford and back. Good pubs were The Crown, The Wharf Tavern and The Navigation. We liked Wedges bakery very much, the people were very nice and helpful." "Did The Avon Ring, superb trip, no poor places, Stopped for lunch and dinner at a pub every day and was not once disappointed."